Why book a Painting Party? Yes, we will book a private party for you! How do I reserve a spot for my party? Just call us at (313)960-4793 or email us at studio099@paintingwithatwist.com however read on for further party information. You get to choose from ANY of over 8000 paintings - some are 2 hour and some are 3 hour classes. You get a private party room with your own artist. No set up, no clean up - just show up! It's the same price as a regular class. What kind of parties can we come for? Absolutely any reason to get together with your friends / co-workers / neighbors!! When can I have a party? 7 days of the week & you name the time (10am-10pm), subject to artist availability. Kid's parties ages 7-12 may be booked 10am-6pm Mon-Fri and 10-4pm Sat-Sun. Minimum age to paint at our studio is 7. Children parties are not allowed during evening hours. What is the minimum and the maximum capacity? The minimum number of guests required for a private party is 10. Our studio capacity is 28. If you are in need of a larger capacity, please notify us of this need immediately. What is the cost and is there a deposit for a party? Private parties can either be booked for a two-hour session at $35.00 per person or a three-hour session at $45.00 per person. Children’s parties, age 7-12, can be booked at $25.00 per person for a two-hour session if the painting selection is chosen from PWAT’s 1.5 hour (12 and under) category. Parties reserved more than 7 days prior to party date require a $50.00 non-refundable deposit paid by credit card. However, if deposit is paid in cash, the deposit is $200 (of which $150 is refundable until 7 days prior to your party). If reserved less than seven (7) days prior to the party date there is a $250, $350 or $450 non-refundable deposit required (depending upon your party session). This deposit may be applied to the cost of the party or returned back to your credit card once your party has checked in with the accurate guest count. Payment for 10 guests will be required 7 days prior to your event. We strongly suggest that you enable online reservation to allow your guests to reserve and pay for their seat(s) online. Acceptable forms of payment in studio are all major credit cards or cash (we do not accept checks). If the host has a minimum of 15 guests (16 including the host), the host will receive a complimentary gift certificate in the amount of the value of the session (ie: $25, $35 or $45). The gift certificate can be used as payment for the private party or a future class. How much in advance do I need to schedule my party? The sooner, the better! We can book a party up til 6 months in advance. How do I know which painting I can choose for my party? Once your private party is booked an invitation to our online painting gallery is generated to view our painting selections. Do you offer any discounts on parties? Kid's 2hr parties are discounted at $25/person. Art selection must be from PWAT kid's 1.5hr category. Minimum age is 7 to paint. 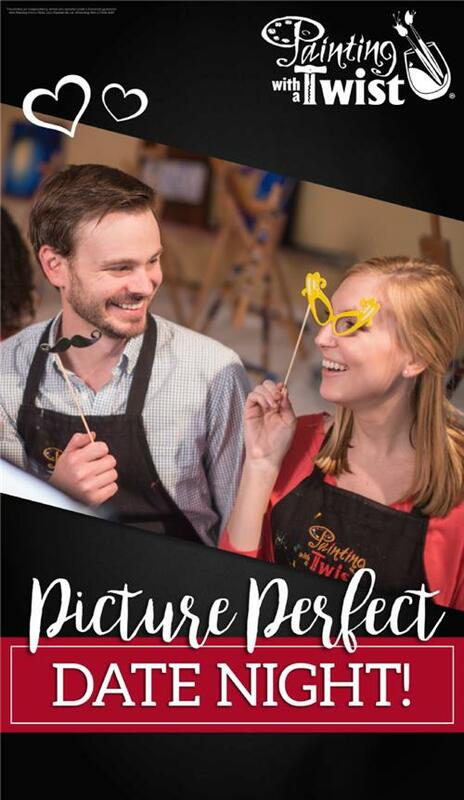 Schedule your party at Painting with a Twist now! BYOB is limited to beer and wine, no hard alcohol please. You must be at least 21 to consume alcohol in the studio. NO ALCOHOL ALLOWED during Family Day classes.